Some dogs are simply over stressed by being left at a grooming shop, and some owners feel the same way. Additionally, there is sometimes the consideration of age, frailty, or a medical condition. For these clients we offer an In & Out service, available by appointment, and for an additional fee of $20.00. 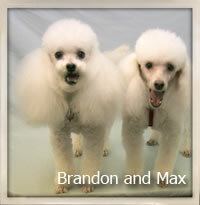 Your pet will be groomed from start to finish, as quickly as possible. However, this allows your pet no resting period, so we encourage your careful consideration. Most dogs can be groomed in three to four hours, on request, with time to rest in between procedures. The In & Out service can still take over two hours, depending on what grooming procedures are requested.